200 (Photo credit: Wikipedia) Two weeks ago, I had a chance to fly to Manila and back. My flight is with Tiger Airways (or SEAir). But before my flight I had some biases against SEAir/Tiger. I used to think that the service would be worst because it's one the small airline companies that operate locally. Well, I was surprised to realize that my flight is good. Like I said earlier, I had some biases against Seair. I used to think that since they still have fewer customers. they will board me in a small propeller-type plane. I would admit that I don't like that type of plane. First, it flies at a lower altitude, which means more chances of turbulence. Second, it is relatively slow compared with Airbus A320 planes. I still remember when I flew Manila-Cebu route in a turbo-propeller Cebu Pacific aircraft., it took us about two hours of travel time. 200 (Photo credit: Wikipedia) Planning is a good exercise in almost anything that we want to do. This is especially true with travel. But sometimes, no matter how good our plan is there are unforeseen situations that may come in our way. Some of the inconveniences or losses that we may experience is having to re-book or most of the time, cancel and buy another plane ticket. Did it happened to you already? Well, here's a tip that can help you at least reduce the cost of last-minute ticket purchases: book on Seair or Tiger Airways. The professional regulation commission (PRC) has announced the results of the October 2012 Certified Public Accountant (CPA) board exam. The result, which came out a day after the last day of exam shows that 4,772 out of 9,987 successfully passed the examination given by the Board of Accountancy. Two examinees from the University of Sto. Thomas (UST), Bren Cruz and Celaica Vibar garnered the top score of 94.14. 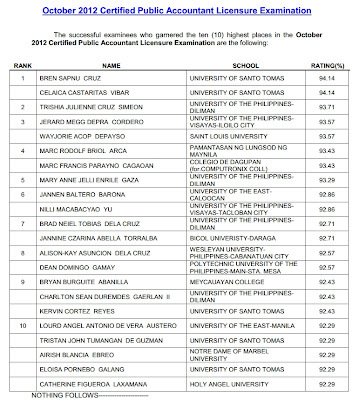 Below is the screen shot of the full list of October 2012 CPA board exam. The complete list of passers can be viewed in the embedded PDF file below. Malacañang Palace, the residence of the Philippine president, from the other side of the Pasig River (Photo credit: Wikipedia) Malacanang Palace declares October 26, 2012 (Friday) as a regular national holiday in celebration of the Muslim Festival Eidul Adha. The declaration was made via Proclamation No. 488. There will be no classes and work during the said day. For those employees who will be required by their employers to report on that day shall receive extra compensation as directed by the labor law. Balance (Photo credit: Wikipedia) The Supreme Court of the Philippines issued a temporary restraining order (TRO) against the controversial Republic Act 10175 or the Cybercrime Prevention Act of 2012. The TRO will serve to prevent the law from being implemented pending the deliberation of the high court regarding the constitutionality of its disputed provisions.